Microwave button panels are all pretty much the same: you type in how long you want the food to be heated for (in the order that the numbers will be displayed on the display), and maybe adjust how strong it’ll be heated (high, medium, defrost, etc.). 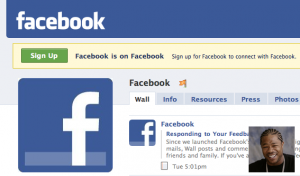 I’m curious as to what other button-panel-formats are possible and which have actually been tried in the past. Here a few possibilities (and actualities). The current popular schema lets the microwaver type in, digit by digit, how long they want the food heated, and the order they enter the digits is the order they’ll be displayed. This at least is a good one-to-one mapping of the order of digits (from temporal into visual). And if you want your food cooked for exactly 2 minutes and 39 seconds, it’s gonna cook it for 2 minutes and 39 seconds. The issue here is that the user’s input options are overprecise. There aren’t any cases where 1-second precision is useful. Another popular one is where the user sets the time with a timer-like dial. Those are cool, since they’re so straightforward, but often the dial is imprecise on an order of 30+ seconds. My proposal: a microwave button panel with just a “+ 1 min” button and a “+ 15 sec” button instead of all ten digits. The user can round their heating time to the closest 15 seconds without deliberating over which of the 10 digits to press. The number of times you hit the keypad is proportional to how long your food will be cooked for, requiring less conscious thought to use the machine. Yes, this is the display you see before getting on the elevator. In the hallway. Just to clarify, all of those numbers are just light-up indicators telling you what floor the elevator is at. Only the arrow at the bottom can be pressed; it’s the main call button. 1. Homogenous look & feel: a. There’s no way to distinguish between buttons and indicator lights (until you try to push them). The numbers look like they can be pushed to instruct the elevator to go to that floor. The only way you find out that they’re not buttons is by trying to push them and then realizing that only once you’re inside the elevator will that sort of panel consist of buttons. 2. Location: The indicator lights are at hand-level, where you would normally only expect to find something that you can manipulate in some way (rather than just look at, which is what these little circles are actually for). A good way to communicate the fact that these are just lights would be to have them up and out of the way. 3. 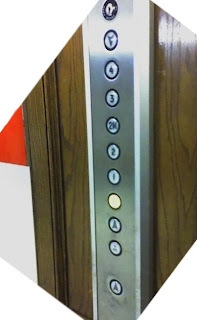 Layout: Everything is in the same “column”, grouping together things that don’t belong in the same group (buttons to call the elevator, lights to tell you where it is, keyhole for maintenance people). If the indicator lights have to be in the same vicinity as the up button, the designer might want to emphasize “HERE’S THE BUTTON. THIS ONE. HERE.” by isolating it and drawing attention to it. So, in short, move the indicator lights out of arm’s reach. If you can’t do that, isolate them so that the one real button stands out. If you can’t do that, at least make them look like non-buttons. Then your building’s guests can just walk up to the elevator, call the lift without thinking about it, and be on their way. I was just thinking about toothbrushes. My toothbrush rack can only accomodate traditional, skinny toothbrushes; otherwise I’d get one of those crazy, curvy, fat toothbrushes. They’re easier to hold on to. Let’s call this toothbrush the “backbend”. It’s sort of bent backwards (relative to the direction the bristles are facing). Perhaps* the motive behind designing a toothbrush with this shape is that that’s the direction your hand is pushing it anyway. But what your hand and wrist actually want is for the object they’re using to be shaped in opposition to directions/angles they’re exerting force in. 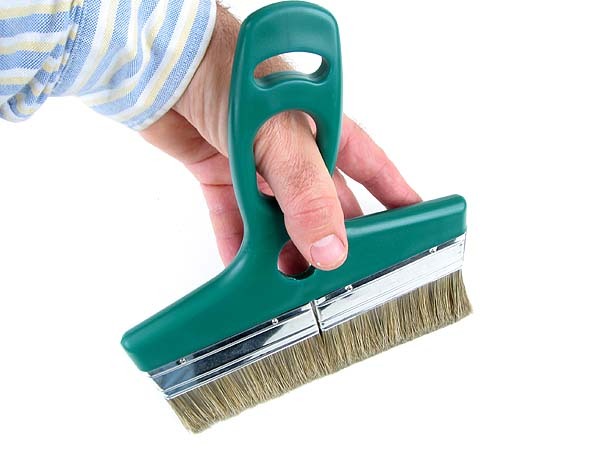 Your hand exerts force on the toothbrush such that your thumb pushing on the toothbrush in the middle is what allows you get the bristles to exert force on your teeth. So if the toothbrush is shaped like the above, the shape of the handle is giving way just where you want to be exerting the most force on it, which in turn requires you to exert even more force. In other words, you want an object’s (handle’s) surface to curve in a direction opposite of where you’re exerting force, so that you get the most leverage. * Perhaps the backbend toothbrush isn’t really designed to be easier to hold. Maybe the purpose is to fit in your mouth easier? If so, I think it’s not worth it for the annoyance of having to hold it. 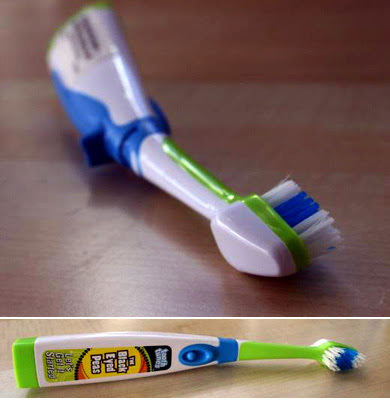 A toothbrush for brushing your dog’s teeth. Actually this bristle arrangement makes a lot of sense. Why don’t these exist for humans yet?